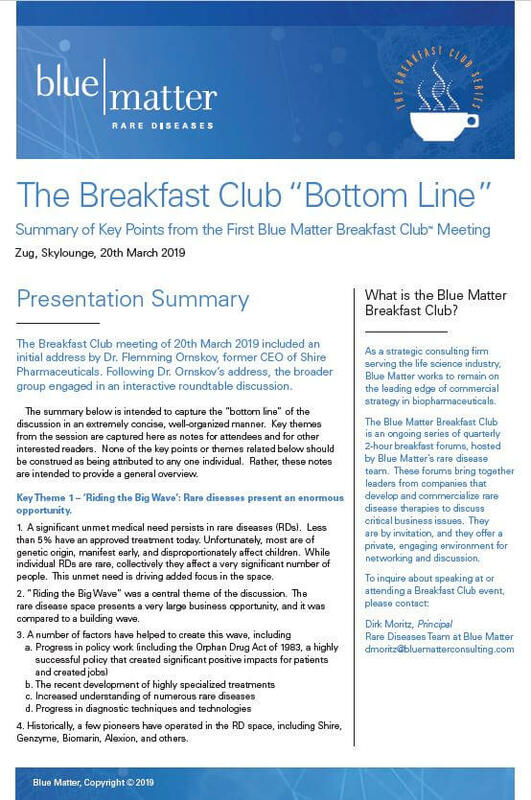 The Blue Matter Breakfast Club is an ongoing series of quarterly two-hour breakfast forums, hosted by our Rare Diseases Team. These forums bring together leaders from companies that develop and commercialize rare disease therapies to discuss critical business issues. These forums are by invitation, and they offer a private, engaging environment for networking and discussion. To inquire about attending a Breakfast Club event, contact Dirk Moritz, Principal, Rare Diseases at dmoritz@bluematterconsulting.com. The first Breakfast Club meeting was on 20th March 2019 at Skylounge restaurant in Zug, Switzerland. Several key themes were raised and explored during this session. This document is an outline-based summary of that discussion, and we hope it is helpful to all interested readers. To learn more about Blue Matter’s work in rare diseases, please click here. Thank you for your interest in Blue Matter Consulting! Please click the link below to download the document.